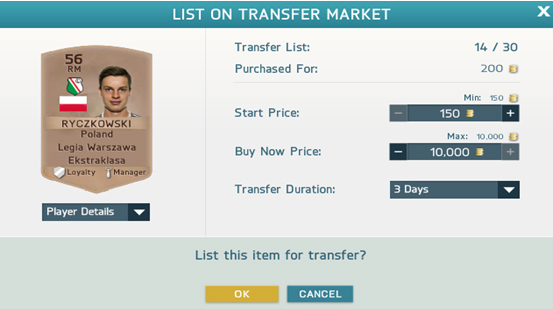 We strongly recommend using the EA FIFA WebAPP for creating auctions and ordering FIFA Coins. This way you can easily manage current transfers on the PC and retrieve all the information you need at one glance, without having to log on the console or being in game. 4. bronze quality players to filterfor worthless players and click "search"
6. "Quick list -Offer on transfermarket"
After successful placement of your order,the auction will be forwarded to our supplier. Using the provided information, he thenwill find and purchase your player. Thus you will be credited your coin amount. Pleasenote that EA charges a 5% transaction fee for every successfully completedauction.